Sound the beauty klaxon and call all the collectors because I have some big GIVENCHY news to share. 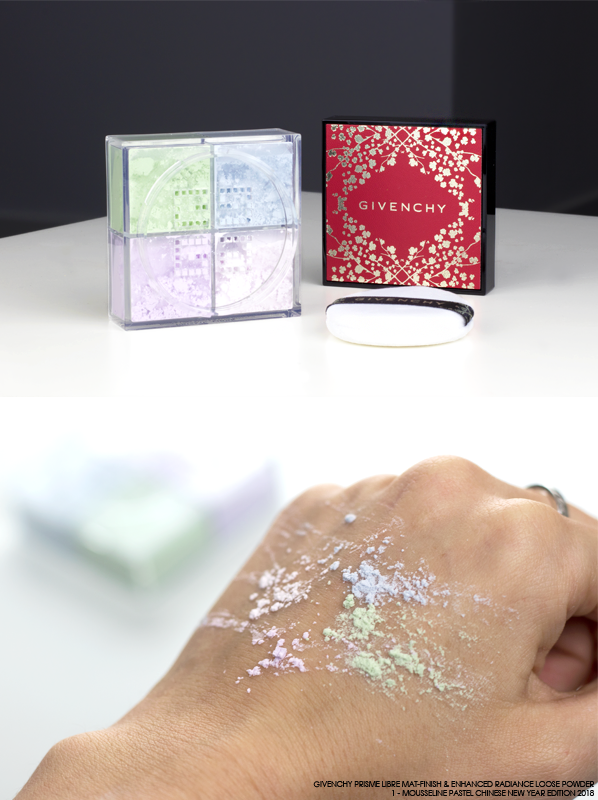 For 2018, GIVENCHY returns for the third year running with our favourite Prisme Libre in Chinese New Year Edition packaging, and what’s even more exciting is that this year it’s joined by a special edition Le Rouge too! 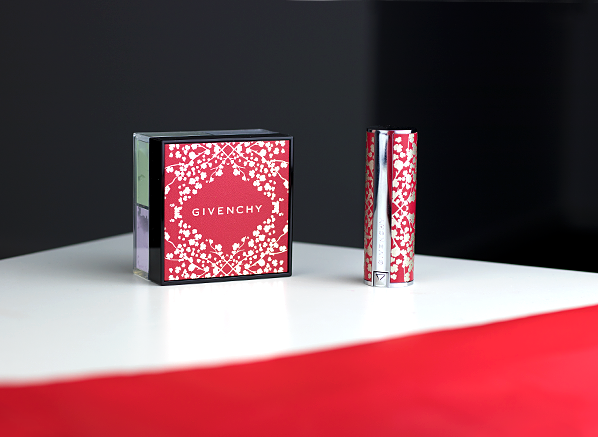 A tribute to joy, prosperity, strength and beauty, the GIVENCHY Prisme Libre & Le Rouge Chinese New Year Editions for 2018 dress the iconic powder and lipstick in a red and gold cherry blossom pattern to celebrate the lunar new year. Every year I think the GIVENCHY Chinese New Year Editions can’t get any better, but every year they prove me wrong, unveiling breathtaking packaging that any beauty lover would adore. Like past releases, this year GIVENCHY has chosen to transform the Prisme Libre Loose Powder in shade 1 Mousseline Pastel, a loose setting powder that comprises of four complementary pastel shades. Designed to colour correct and set all skin tones, the coveted powder is made up of green, blue, purple and white powders that merge together to mattify, conceal imperfections and counteract dullness. For the first time ever, GIVENCHY has released a special edition Le Rouge for Chinese New Year. Presented in the same gold and red cherry blossom pattern as Prisme Libre above, the Le Rouge Chinese New Year Edition is quite possibly the most luxurious lipstick I’ve ever laid eyes on. For this special edition, GIVENCHY has chosen to put the shade 305 Rouge Egerie in the spotlight, a vivacious red-pink that’s bold and powerful – the perfect match for a collection that’s all about positivity and good fortune. 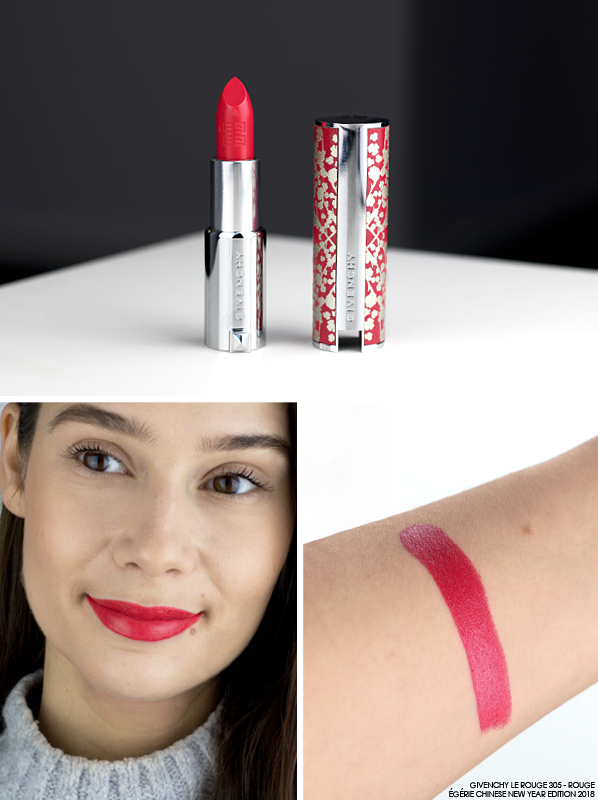 The lipstick itself has a creamy texture that is long-lasting and comfortable on the lips and it leaves a pop of beautiful colour in a semi-matte finish. This entry was posted on Wednesday, January 17th, 2018 at 9:47 am and is filed under Make-up, New products, Spotlight On, Swatches. You can follow any responses to this entry through the RSS 2.0 feed. You can skip to the end and leave a response. Pinging is currently not allowed.